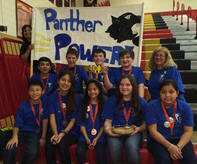 Congratulations to our Award-Winning Panther Robotics Team! In 2014 our Robotics Team won the NJ Regional’s Champions Award and then 2nd Place for Innovative Solution at the National Competition at LegoLand, California! This academic club involves a lot of research and science experiments. We begin planning to build our Lego mission units during the summer months so we can get a jump start on programming the robot before the school year starts. We begin as a club activity and then students earn their way onto the Robotics Team. In accordance with the First Lego League (FLL) guidelines, the Team can have no more than 10 student members. This is done by evaluation of all students with a rubric at each meeting. By October our 10 members are selected. We meet three days a week from September to mid-December. The Team does the work. They know their coaches and mentors do not always have the answers and are there for guidance. Students that did not make the Team are in the Club and are invited to come to designated meetings where we do experiments. When we have parent volunteers, we also plan meetings for the Club to learn how to program robots. Everyone is expected to come to the competitions to cheer on the Team. This is a fun afternoon for all and a learning experience for those hoping to make the Team in the future. Every year, the FLL works with experts in the field to create a Challenge that relates to a significant real-world issue. Our Club, following the FLL rules, challenges kids to think like scientists and engineers. During the season, the team will build, test, and program an autonomous robot using LEGO MINDSTORMS® to solve a set of missions in the Robot Game. They will also choose and solve a real-world question in the Project. Throughout their experience, the Team will operate under FLL’s signature set of Core Values. The end result is a two-part Challenge that requires research to complete “The Project” and engineering to master the complex missions of “The Robot Game.” It’s a fun and exciting way to encourage kids’ minds. In the Robot Game, teams design, build, program, and test autonomous robots that must perform a series of tasks or missions. In the Project, teams research a real-world problem in the field of the Challenge theme, create an innovative solution, and share their research and solutions with their community. For roughly eight fast-paced weeks, teams work as a group to overcome obstacles and meet challenges. The team/club practices ‘gracious professionalism’ which encourages teamwork while learning from and interacting with their peers, adult coaches, mentors and volunteers. Teams work to find creative solutions to the problems presented to them by the FLL. The FLL problems are referred to as “the Challenge’. Once finalized, teams compete in optional local and regional tournaments. This is their chance to celebrate their accomplishments with other FLL teams, family, and friends. After the hard work and a lot of fun, children come away with a sense of accomplishment, greater appreciation of science and technology and how they might use it to positively impact the world around them. In addition, they cultivate life skills such as planning, brainstorming, collaboration and teamwork, as well as research, presentation, and technical skills. Parent involvement is required for our success. There are many ways for parents to get involved including: programming, guidance, research, general volunteers on weekdays, publicity, team apparel and PR items, web design, fund raising, spirit, and organizing snacks, field trips, etc.